Weak fundamentals have contributed to the recent selloff in natural gas futures. The front month contract is currently trading 14.6% lower compared to last week. Expectations of lower heating demand during the fall, high production and healthy inventory levels are setting the stage for lower prices ahead of the winter as the market continues to discount the winter risk premium. 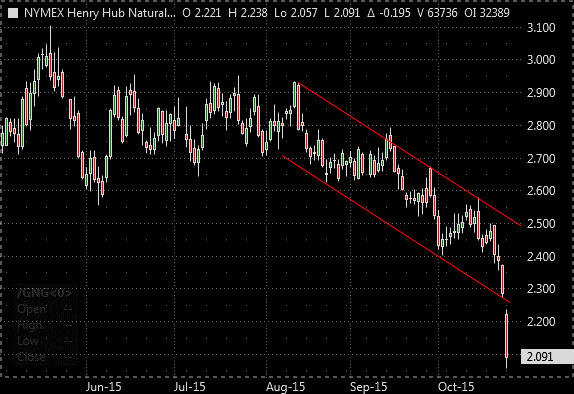 The chart below shows that natural gas futures has been trading on a bearish channel since August 2015. Three drivers have weighed on natural gas prices. Consensus across several forecast models indicates that mild weather will persist across most of the continental U.S through November. Traders expect that above normal temperatures will curb early heating demand, so there will be more natural gas available for injection into storage. The expectation of lower demand due to above normal temperatures across consuming regions has been the main driver that has pushed prices to a three and a half year low. The National Oceanic and Atmospheric Administration (NOAA) recently released its 2015/2016 winter outlook. NOAA expects that this year’s El Niño, which is among the strongest on record, will influence weather and climate patterns by impacting the position of the Pacific jet stream. There are other factors (e.g. Arctic Oscillation, Eurasia snow cover) that could change the expected effect of a traditional strong El Niño winter. 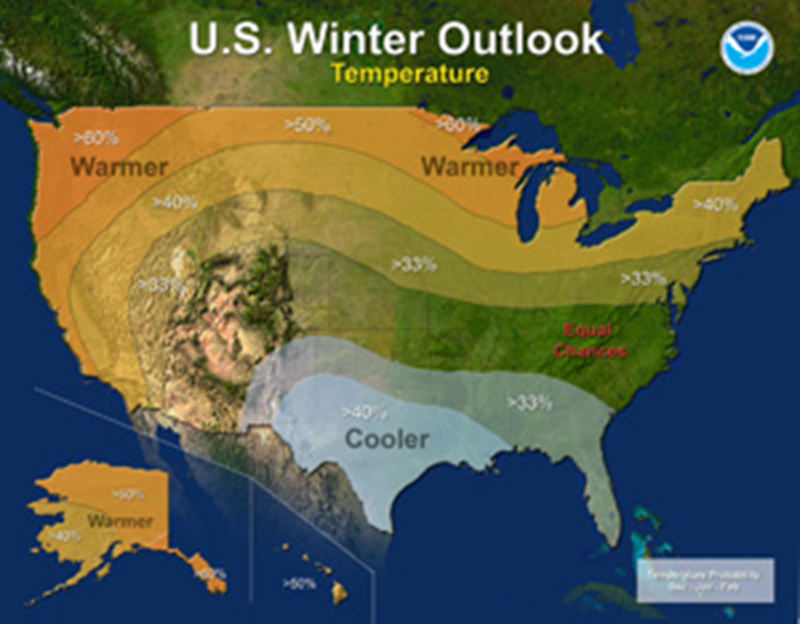 The chart below illustrates NOAA’s Winter Temperature Outlook, which is calling for above-normal temperatures across much of the West and the northern half of country. Moreover, below-normal temperatures are most likely in the southern Plains and Southeast. Despite a reduction in the number of rigs drilling for natural gas and oil, which has been driven by low prices, natural gas production remains close to record levels. Moreover dry gas production is still 2.4% greater than a year ago according to the Energy Information Administration (EIA). Strong production has allowed inventories to replenish at a much faster rate compared to the 5-year average increase. 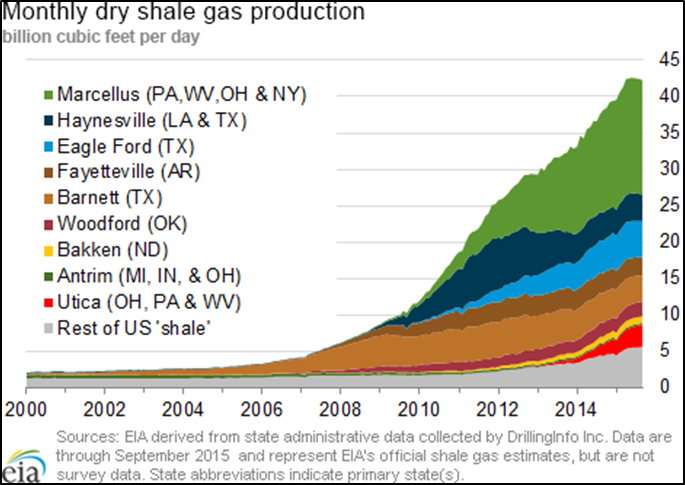 The chart below illustrates that dry shale gas production has soared across the main basins. The latest EIA Drilling Productivity Report showed that Total output of natural gas across seven key shale plays in November is projected to fall 294 MMcf/d, or 0.7%, to 44.8 Bcf/d from October. Market players will closely monitor production levels throughout the winter. Working gas in underground storage currently stand at 3,814 Bcf, which is 4.5% higher compared to the 5-year average level. The EIA projects that end of injection season (October 31) inventories will total 3,956 Bcf. However, with mild weather through early November, injections will likely continue. Therefore inventory could top 4,000 Bcf, which would exceed EIA’s forecast and the current maximum level of 3,929 Bcf that was reached on November 2, 2012. So far this injection season inventory builds have exceeded those of the 5-year average by 19%. Without sustained below normal temperatures throughout the winter, gas price gains will likely be limited. Current price action is not typical this close to the winter, however the overall fundamental picture is quite bearish. The first chart shows that we broke through the bearish trading channel support level, but the market is now in oversold territory. With a large number of short positions, a price correction could follow this massive dip as traders close their short bets to take profits. Nevertheless, any short covering rally should give the bears another opportunity to sell at a higher price if the fundamental picture remains in place. Natural gas and electricity consumers should continue to benefit from this low price environment. As a result of lower natural gas prices wholesale electricity heat rates have firmed up; however, the downward move in natural gas prices has more than offset the increase in heat rates, so electricity prices across most market have followed the same natural gas price trend, but at a lower rate. Contact your Acclaim Energy representative to discuss how you take advantage of current market conditions.